After a reasonable start to the trip, pubs 3 and 4 were somewhat disappointing, I pushed on to pub 5. The hotel bit didn’t exactly fill me with hope but it looked well attended as I approached. Inside it was an open and roomy space with a mix of armchairs, sofas and normal wooden tables and chairs. 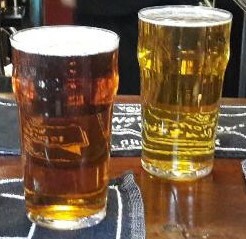 Despite there being six handpumps there was a choice of three beers, being a Youngs hostelry these were Youngs Bitter and Special with a guest of Wimbledon Copper Leaf. Having long lost any desire to drink Youngs beers I opted for the Copper Leaf, It has the appearance of a BBB, but has Mosaic hops in it , so that was fine. It wasn’t a bad place though not my kind of thing really, It was better than the previous two stops. Next up was The Windsor Castle, It had the look of a proper boozer despite the word restaurant painted on the outside. Once inside it still resembled a proper pub with a good mix of clientele and all the fixtures and fittings of a proper pub. A pint of Longman APA seemed to fit the bill, unfortunately the quality was poor, not quite poor enough to take back, a decision I regretted, by the time I got half way down I could take no more so left it behind. Another disappointment. Any salvation of this trip now rested on the last two pubs.